“Mother’s Gift” is a retelling of “The Goose Girl,” which has been one of my favorite fairy tales ever since I was a child. 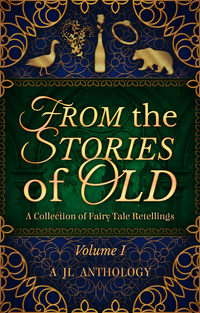 When we decided to publish an anthology of fairy tale retellings, I knew from the start that I wanted to adapt The Goose Girl as a homage to childhood nostalgia. The main theme behind the story is that being true to who you are and honest with yourself and your loved ones will always prevail over trying to lie or cheat to get what you want. The very definition of Young Adult fiction is “coming of age stories.” A story should be about a character growing and changing, and the Young Adult genre allows for the most flexibility in the types of these stories that can be told. In my story “Mother’s Gift,” there is a ring that plays a pivotal role in the plot. I designed this ring after my own high school class ring, which went missing soon after graduation, and I didn’t find again until I finished college. When I decided to add the ring, I saw my class ring and decided to write it into the story. Corinne Morier is a fantasy author with a penchant for writing stories that make readers feel. Born and raised in Oakland, California, she now lives in Japan, where she works as a TEFL teacher for her local elementary school. In her free time, she enjoys swimming, watching anime, and, of course, writing. Her paranormal flash fiction story The Photo was published by Roane Publishing, and her fantasy short story Mother’s Gift is available in the anthology From the Stories of Old. You can keep up with her latest by following her blog at http://corinnejet.wordpress.com and her YouTube channel ALTKaren, where she posts videos about her life in Japan.